TREX Composite Decking Elite Dealer - Decks & Docks Lumber Co.
An innovator in the world of decking, Trex is a leading manufacturer of composite decking boards. Unique processes combined with a variety of styles makes Trex decking a great choice for a stylish deck or dock that is built to last. Trex’s capped composite decking features an extra layer of protection. While the inside of the decking board is similar to more traditional composite boards of the past, the “cap”, or outer shell, is tougher and works as an effective protectant against rot and mildew. This outer shell also allows for stylistic touches like more realistic wood grain and a variety of colors. When you invest in high-quality Trex composite decking, you’re ensuring your deck or dock will look great for years to come. Aside from the occasional soap and water cleaning, Trex decking does not require the same level of maintenance as a wood deck—saving you time and money in the future. In 1996, Trex changed the decking with wood-thermoplastic composite boards, known simply as composite decking boards. 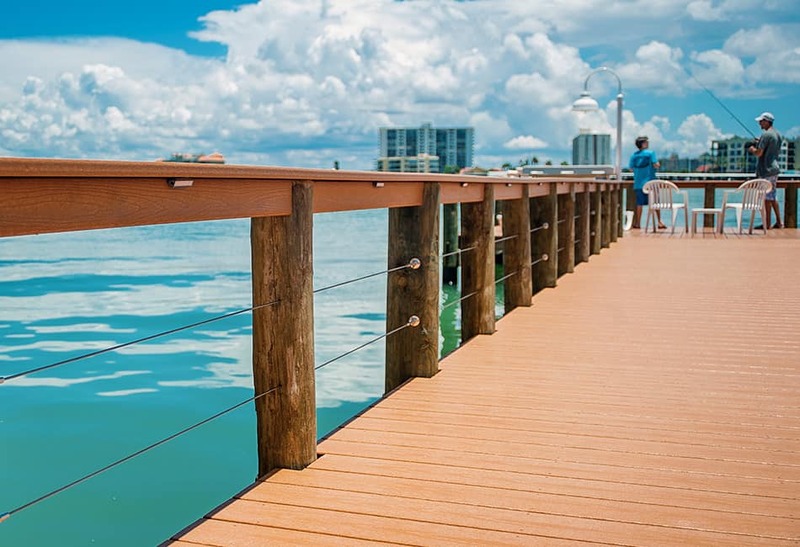 The patented process for creating these boards includes recycling spent sawdust and other wood waste, combining it with used plastic and a binding agent to create gorgeous boards for decks, docks, and other outdoor projects. Sawdust, old wood pallets, wood chips, and wood fiber are frequently used to create Trex composite boards, as are plastic bags, plastic wrap, and packing films. Rather than being tossed in a landfill, these items are crafted into high-quality boards. In fact, it’s estimated that Trex keeps 400 million pounds of wood waste and plastic from landfills annually. Trex products can use over 140,000 plastic shopping bags in just one 500 sq. ft. deck, and Trex is one of the nation’s largest plastic film recyclers. This takes the expression “one man’s trash is another man’s treasure” to a whole new level. Trex boards may mimic wood, however, they also have their own unique styling and beauty. Plus, Trex composite decking boards don’t suffer from some of the same issues that wood can, like rotting or fading. In fact, when properly installed and maintained, Trex decking is longer lasting than traditional wood decking. Trex offers three different decking product lines to meet homeowner’s and contractor’s needs. Trex Transcend: Trex’s top-of-the-line boards, Trex Transcend utilizes the company’s proprietary shell technology that protects the boards from fading, staining, mold, mildew, and scratching. Trex Enhance: Enhance offers fade and stain protection as well as mold and mildew resistance in three different colors. Available in 10 different colors, Transcend mimics hardwood while still protecting the environment. Trex Select: The most affordable of Trex’s offerings, Trex select is available in 5 colors and is slightly thinner than Trex Enhance and Trex Transcendence. Trex Select has enhanced mold and mildew resistance. To find out which of Trex’s products are the best suited for your particular project, speak to a Decks & Docks professional. Trex also offers three different product lines for railings. Trex Signature Railing: Trex’s top-of-the-line railings offer unprecedented style. Combining durability and design, Trex Signature Railing can help you make the most of your view with a rod or curved rail. Available in three colors with a variety of mix-and-match options, you can truly capture what is unique about your home and deck with these rails. Trex Transcend Railing: Available in 7 colors, Transcend Railing can be easily coordinated with other Trex products to create a visually appealing retreat. Sturdy and well-designed, these railings are suitable for a variety of housing styles. Trex Select Railing: With Select, you can combine style and affordability. While there are fewer options than the Signature railing, Select railing components are easy to install for those who like to do it themselves. When you choose Trex, you’ll find a world of possibility waiting. With numerous colors and style lines, your deck can help enhance the beauty of your home. With Trex, you can create a unique space that reflects the character and architectural feel of your home. To help you craft an environment that will have you outside lounging daily, Trex also makes railings and lighting that work to create cohesive, enjoyable outdoor spaces. Whether you’re envisioning a curved deck or a two-story deck, there’s a Trex board that’s a perfect fit. And if you’re unsure as to what you want your deck to look like, Trex offers some beautiful inspiration to get your creative juices running. Trex has been recognized as the top brand for Brand Familiarity, Brand Used Most, and the Brand Used in the Past Two Years, in Builder’s Brand Use Study—earning top marks for 10 years in a row. Green Builder Media honored Trex by naming it the “Greenest Decking” brand for the 7th straight year. Trex was given the “Best of Houzz” Design Award for the third year in a row. Trex has shown that its products are more than just reliable and dependable—they’re exceptional. Their capped composite decking continues to set the mark for high-quality decking. In addition to helping reduce waste through its innovative practices, Trex also leads recycling programs and environmental projects. Trex provided the decking materials for a boardwalk in the Maui Wildlife Refuge complex and has a program for helping kids get into recycling. Trex also assists in educational efforts to keep the environment clean and healthy. Decks & Docks is a Trex Elite Dealer. We have proudly sold this composite decking for decades, sharing its benefits with our clients. We’ll help you select the right composite decking, railings, and lighting for your project and your budget. To learn more about Trex and whether it’s a good fit for your next project, contact us today.